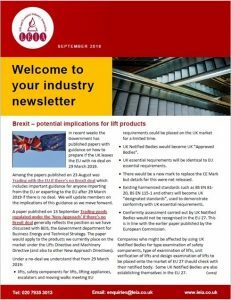 Brexit – potential implications for lift products, LEIA new starter, revised lift standards and transition periods – just some of the features in our September Newsletter. See our September 2018 Newsletter to read the full articles and other items that cover current and topical items affecting our industry. Previous editions of our newsletter can be found here.